This article consists of instructions on how to properly configure and customize the Filter settings in Email DLP Admin Console in order to best suit the environment of your organization. ☆ 1 - Go to "Define Address Groups" under "Account" menu in the left pane and click "+ Create". ☆ 2 - Enter "Group Name" and list of email addresses in the "Addresses" field. 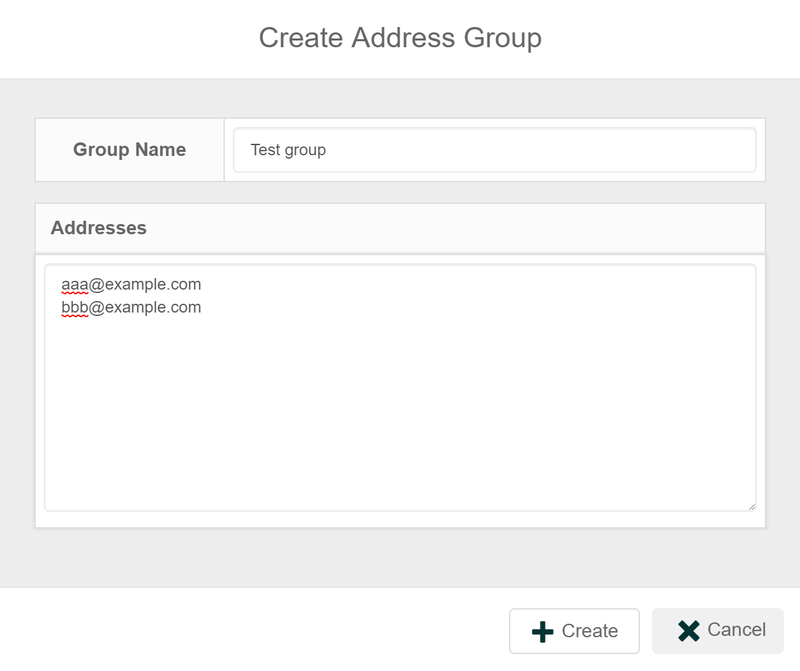 After input all the addresses, click "+ Create" to create the Address Group. - Please input Envelope-To or Envelope-From addresses in mail groups. - Address Group will be used in "Define Filter" and "Define Encryption Policy" menu. You can add or edit email addresses in the Address Group by clicking on the pencil icon on the right side as shown in the image below. *Note - If you delete the Address Group that is in Use, the Filters and Encryption policies that use this Address Group will also be deleted. ☆ 1 - Go to "Define Rule Groups" under "Filter" menu in the left pane => Click "+ Create" to create a new Rule Group. ☆ 2 - Enter the Group Name => Click "+ Create"
1) Rule Name: Enter the Rule name. 2) Priority: The priority must be between 1 and 99999. A lower value corresponds to a higher priority. Send: Send directly right away. Suspend: Suspend email for a period of time before releasing out the email. Discard: Discard the email right away. 4) Additional Information: When Action is selected, the Additional Information field will be displayed differently depending on the Action selected. Additional Bcc recipients: You can specify the additional Bcc: header. Multiple email addresses can be specified one address per line. The maximum number of addresses allowed is 5. Encrypt attachments: You can specify whether the attachment file should be encrypted or not. Suspension Time (Minutes): If "Suspend" is selected, you are required to specify the period of time the email shall be suspended before being released automatically. Do not release the suspension automatically: You can determine whether the email shall remain suspended even if the Suspension Time has passed. If the checkbox is checked, the Suspension Time will be disabled. Note that the email can remain in the suspension period for up to 10 days before being deleted. Note: If "Discard" is selected, the Additional Information will not be displayed. 1) Notification: Set notification email to be sent to the sender. Match all the following (AND): Select this option to apply all the conditions you define for the filtering rule. Match any of the following (OR): Select this option to apply any one of the conditions you define for the filtering rule. Match all messages: Select this option to apply the conditions to all emails. Optional Header: Specify by which header to search the keyword from. Envelope-To: Email addresses in Envelope-TO header. Note that it is the RCPT TO part of the SMTP communication. 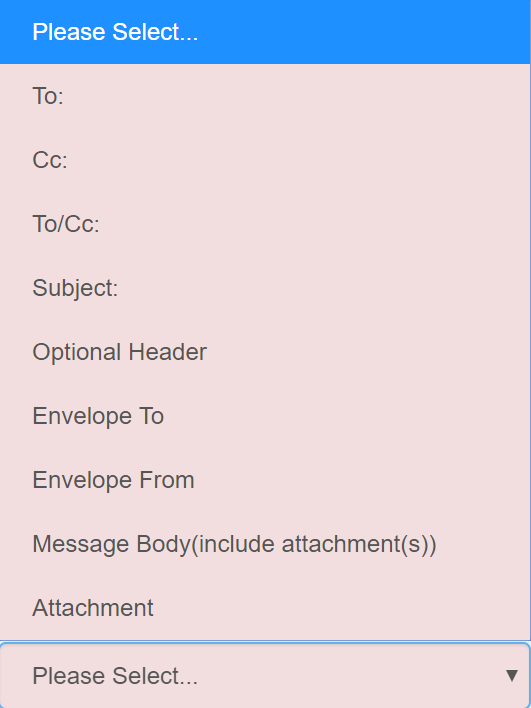 Envelope From: Email addresses in Envelope-FROM header. Message Body(include attachment(s)): Select this option to inspect for the keywords contained in message body and attachments. Attachment: Select this option to check if the attachment exists or not. If one of the followings (To:) or (Cc:) or (To/Cc:) is selected, the two options for specifying the type of Pattern will be displayed as shown above. 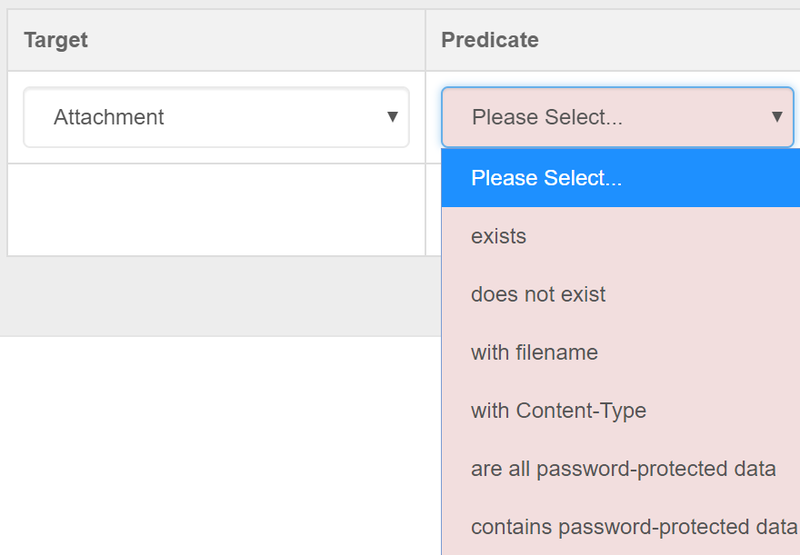 If "Optional Header" is selected, the field for specifying the Header will appear as shown above. You can refer to this article for how to set Optional Header: What is Optional Header for? exists: Apply the rule if the value in the Pattern field "exists" in the Target selected. does not exist: Apply the rule if the value in the Pattern field "does not exist" in the Target selected. 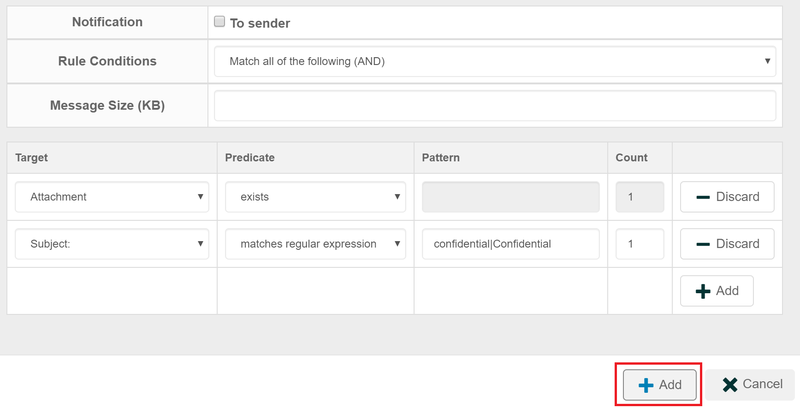 matches regular expression: Apply the rule if the Target "matches the regular expression" value specified in the Pattern field. 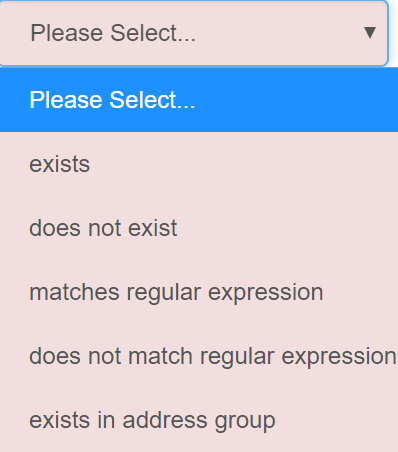 does not match regular expression: Apply the rule if the Target "does not match the regular expression" value specified in the Pattern field. exists in address group: Apply the rule if the Target exists in the address group. Note that if "exists in address group" option is selected, the Pattern field will be shown below for selecting the Address Group. If "Attachment" is selected in the Target field, the following options will appear in Predicate. with filename: Apply the rule if the value set in Pattern field is found in the filename of the attachment. with Content-Type: Apply the rule if the value set in Pattern field is found in the Content-Type of the attachment. are all password-protected data: Apply the rule if all attachments are password-protected data. contains password-protected data: Apply the rule if one or more attachments are password-protected data. 5) Pattern: Enter the email address, domain address, keyword or regular expression you wish to apply as a rule condition. Regular expression: can be used to substitute for any other character or specific characters in the string. - It may take a longer time for HENNGE Email DLP system to inspect an email if you use a regular expression that matches with most characters and numbers such as ". *"
- If the Predicate is selected as "matches regular expression" or "does not match regular expression", it allows a query to search by using the regular expression as defined in POSIX 1003.2. 6) Count: Specify the frequency of the value you have input in the Pattern field. For instance, if the keyword "Confidential" is set in Target field and the Count is set as "3", the email that contains the word "Confidential" more than 3 times will be applied to this rule. *Note - You can set the "Count" when the "Target" is NOT "Attachment" and the "Predicate" is one of the following: "exists", "matches regular expression" or "does not match regular expression". ☆ 3 - If you want to add another "Rule Conditions", click "+ Add" button on the right side. 1) Message Size(KB): You can specify the size of the email messages you want to apply the rule to. The rule will be applied when the message is larger than the specified size. After specifying all the conditions, click "+ Add" to create the Rule. ☆ 4 - If you want to add a new Rule to the Rule Group, click the Plus sign on the right bottom of the Rule Group. ☆ - You can Edit the Rule by clicking on the Gear icon, and Delete by clicking on the trash bin icon as shown below. ☆ 1 - Go to "Define Filter" under "Filter" menu in the left pane. Click "+ Create" to create a new Filter. 1) Priority: The priority must be between 1 and 99999. A lower value corresponds to a higher priority. 2) Sender: Select the Address Group for the filter. 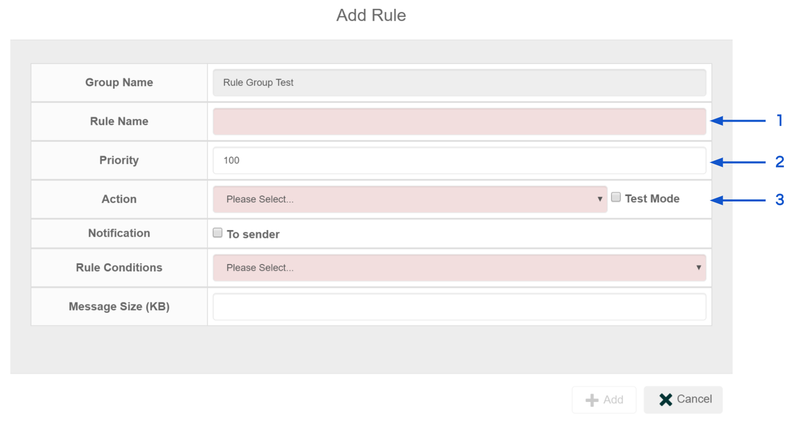 You can select "All" if you wish for the rule to be applied to all senders. 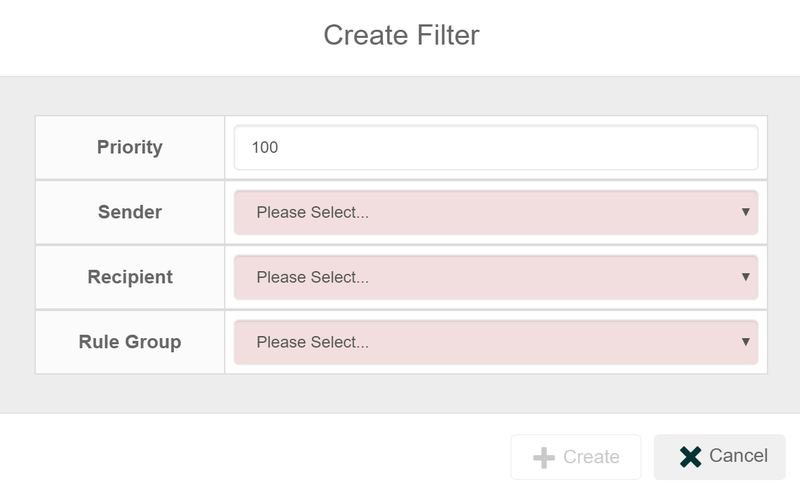 3) Recipient: Select the Address Group for the filter. You can select "All" if you wish for the rule to be applied to all recipients. 4) Rule Group: Select the Rule Group. ☆ - You can Edit theFilter by clicking on the Gear icon, and Delete by clicking on the trash bin icon as shown below. ☆ 1 - Go to "Define Encryption Type" under "Encryption" menu in the left pane. Click "+ Create" to create a new Encryption Type. 1) Name: Enter the Encryption Type name. 2) Password Type: You have the option of selecting a password generated random every time or a fix password. 3) Encoding of Filename: This will be the Encoding Type for the ZIP encryption of the attachment. 4) Notification: You can select the Encryption Password to be sent to Sender and/or the Recipient. 5) ZIP Filename: The file name of the resulted ZIP encrypted file. 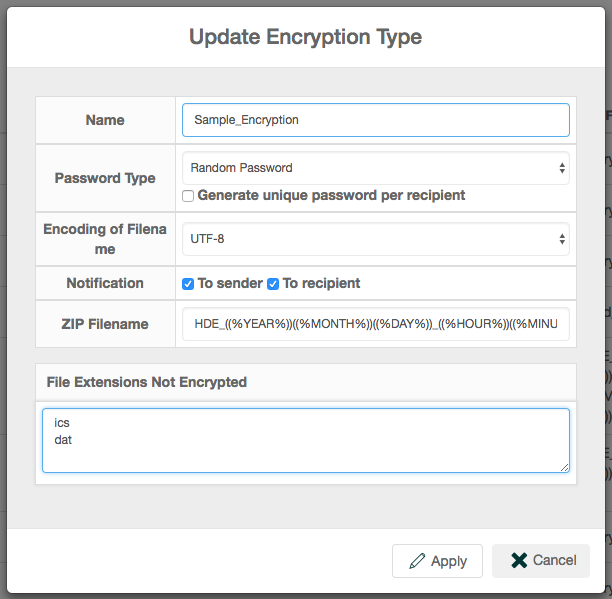 6) File Extensions Not Encrypted: File extensions to skip zip encryption. ☆ - You can Edit the Encryption Type by clicking on the Gear icon, and Delete by clicking on the trash bin icon as shown below. ☆ 1 - Go to "Define Encryption Policy" under "Encryption" menu in the left pane. 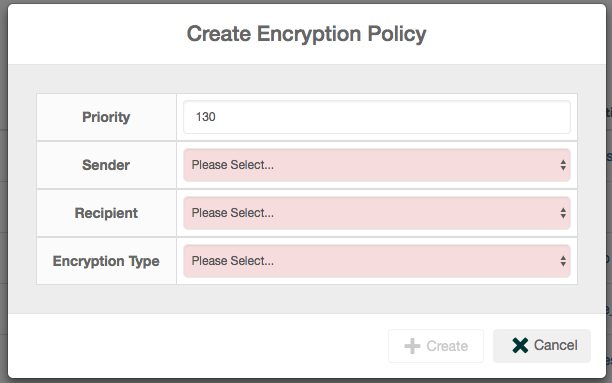 Click "+ Create" to create a new Encryption Policy. 1) Priority:The priority must be between 1 and 99999. A lower value corresponds to a higher priority. 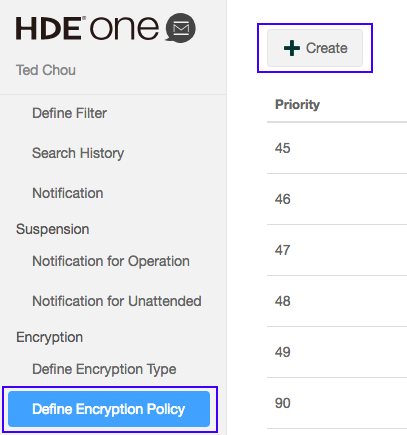 4) Encryption Type: Select the Encryption Type that will be applied for the created Encryption Policy.